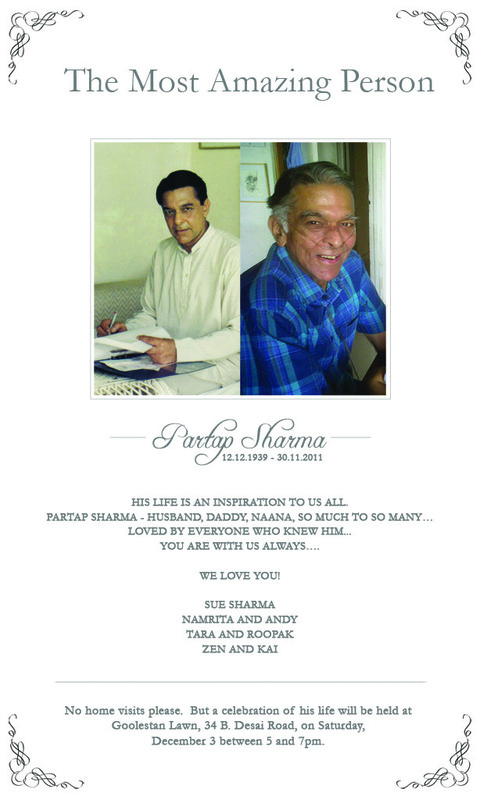 Partap Sharma [Curzon 1950-54] passed away on 30th November 2011. Known as the Golden Voice of India, Partap was always warm, encouraging and inspirational. The world will be sadder without him but greater for his contributions. Partap Sharma: playwright, author, actor, director and commentator. Sharma was born in Lahore which was then part of India and is the oldest son of Dr. Baij Nath Sharma and Dayawati (Pandit) Sharma. Sharma’s father was a civil engineer who served as Technical Advisor to governments in Ceylon, Tanganyika and Libya and later retired to their ancestral property in Punjab as a gentleman farmer. This colourful Punjabi village forms much of the backdrop of Sharma’s novel, Days of the Turban. Sharma’s early education was in Trinity College, Kandy, Ceylon (now Sri Lanka) and then at Bishop Cotton School, Shimla. Sharma received a triple promotion and completed school at 14 before going to study at St. Xavier’s College, Bombay mainly because all other universities in India required a minimum age of 16. He is married to Susan Amanda Pick, they have two daughters: Namrita and Tara. Tara is, of course, known to many as the beautiful Bollywood actress, Tara Sharma. Sharma’s association with the Indian National Theatre, Mumbai, began in 1961 with the production by it of his first full-length play “Bars Invisible” and continued till the eventual production of the banned “A Touch of Brightness.” While working at his writing, Sharma freelanced as a narrator for short films and newsreels. In due course, he also directed a few documentaries for the Government of India. He was TV host of the popular programme “What’s the Good Word?” produced by Television Centre, Mumbai. One of India’s leading voices heard in narrations and commentaries on film, radio and TV, he has voiced many national and international award-winning documentaries and short films. He is known as the golden voice of India, and has often been referred to in the Press as simply ‘The Voice’. He is the voice on most of the Son et lumière shows produced in India, including the one still running forty years later, at the Delhi Fort, in Delhi. The Framework Of Famine, 1967, an investigation of how nature’s devastation is compounded by human corruption and inefficiency; banned for it’s “ruthless candour” then released after other documentary-makers protested. The Flickering Flame, 1974, a study of the mismanagement of the energy crisis and its effect on the suburban housewife; banned and never released. Kamli, 1976, a short film depicting the status of women in rural Indian society. The Empty Hand, 1982, (co-directed) a prize-winning audiovisual about the art of karate. Viewpoint Amritsar, 1984, co-directed a film about the Golden Temple and environs in the aftermath of Operation Bluestar. The British Raj Through Indian Eyes, 1992, a documentary series telecast in 1992 by Channel Four Television UK. Part I: The Uprising of 1857. Part II: The Massacre at Jallianwallah Bagh 1919. The museum of the British Empire and Commonwealth, in Bristol, now has a permanent section entitled The Sharma Archive consisting of 30 video and 67 audio tapes made by Partap Sharma. Interviews and footage of Indian nationalists, freedom fighters and writers. Indian perspectives on the Raj. Some transcripts available (CDs, Videos and Cassettes). Sailing Around The World And Discover America Yachting Rally, two video programmes directed by Sandhya Divecha and produced by Sharma’s Indofocus Films Pvt. Ltd. British Raj Hindustani Nazron Se, 1995-98, A Hindi TV Serial. The Bandung Sonata (2002) Filmed in China, Sharma played Nehru in this international film which was subsequently re-titled for release in China as Chou-en-Lai in Bandung. Sharma’s literary genius was recognized at an early age, and he won numerous first prizes in school and university in debating, elocution and acting including first prize at the All India Inter-University Youth Festival, Delhi, in 1958. 1971 National Award for the lead role in the feature film “Phir Bhi” which also won the National Award for the best Hindi film of the year. Cleo Award U.S.A for best voice. 1976 RAPA First Prize for best voice in radio spots. 1992 the “Hamid Sayani” Trophy for a lifetime of all-round excellence in radio and television. 2000 Ad Club of Mumbai Award for Lifetime Contribution to Advertising. 2004 the “Dadasaheb Phalke Award” with the citation ‘the voice of India’ on behalf of 35 associations of professional cine workers representing all branches of the Indian film industry. India Who’s Who, Infa publications, India. Contemporary Authors, Gale Research Company, Detroit, U.S.A.
Asia’s Who’s Who, Asian Publishing House, India. Dictionary Of International Biography, International Biographical Centre, Cambridge, England. Partap Sharma, who died this week, was a polymath: author, playwright, documentary filmmaker, anchor, actor, voice-over artist and more. His titles were many, but it is for other qualities that I would like to remember him today. The first is courage. When his award winning play, A Touch of Brightness, was prevented by a regressive state from leaving India to perform abroad, Partap, refusing to be cowed down, engaged Soli Sorabjee to argue his case. They won the case — seven years later — and the play about a woman in Mumbai’s red light area went on to get international success and recognition. That should have been ample evidence of Partap’s grit: nine years ago, after he was struck down by a debilitating attack of chronic obstructive pulmonary disease and emphysema which left him wheel-chair bound and in need of a constant supply of oxygen, Partap once again refused to allow circumstances to dictate his story. He went on to record Macbeth, Julius Caesar and The Merchant of Venice in his famous voice, enacting all the parts — even the female ones! Partap himself was nothing if not encouraging, his lovely home by the sea was open to all: celebrated litterateurs along with struggling poets, confused writers, footloose students and hungry neighbours. If these qualities were enough to make him larger than life, it was his swashbuckling sense of self-actualisation and adventure that made him a hero to many. He was a black-belt Karate expert, a rider of bare back horses, a solver of neighbourhood crimes with his famous Alsatian Ranjha of the “Dog Detective series”, the owner of a magnificently restored shiny black Mercedes-Benz, an above-average chess player, an aficionado of books and ideas, and a lover of Mahabaleshwar where he would disappear for long writing spells. I could go on. But suffice to say that the copywriter who came up with the “Complete Man” sign off, could well have had Partap in mind. But that is not all. Above all, it was for Partap’s qualities of decency and grace that he will be cherished, His human qualities outstripped his considerable material and creative success. It is fitting that he died surrounded by his daughters, the lovely Namrita and Tara, and their families, his many friends and in the arms of his devoted wife-comrade-companion and champion Sue. Two days before he died, I met her at his bedside in the ICU. I remember thinking that she had gazed at him and stroked his face with the tenderness and love of a young bride. Every man should aspire to live and die like that. 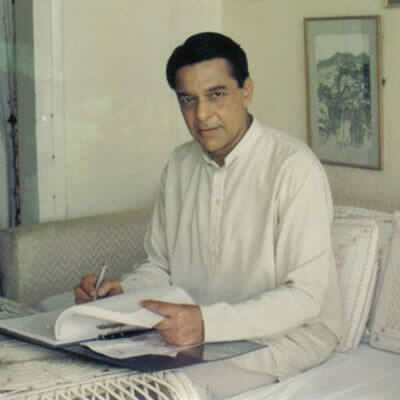 The Biography is an extract from http://www.partapsharma.com/, where you can read more about this great man. Thank you so much for your kind words about Dad. As you can imagine it’s devastating for us but I truly believe Daddy is with us always and it is only the body that is resting. Words cannot express how much Daddy means to me and us as a family and how inspirational, brave and loving he was and is. He touched so many lives and his rich legacy continues to do so. I write about Daddy often on my blog www.tarasharmashow.com and am grateful he got to meet both my kids and he knew my sister Namrita’s baby was soon to be born. On behalf of my Mum Sue, sister and our husbands and kids thank you and do keep writing your thoughts on Dad to me, it helps me keep him alive. This entry was posted in Articles, News, Obituary, Post, Spot Light and tagged News about OCs, Obituary, Partap Sharma, Spot Light, writer on December 15, 2011 by admin. As you can imagine it’s devastating for us but I truly believe Daddy is with us always and it is only the body that is resting. Words cannot express how much Daddy means to me and us as a family and how inspirational, brave and loving he was and is. He touched so many lives and his rich legacy continues to do so. I write about Daddy often on my blog http://www.tarasharmashow.com and am grateful he got to meet both my kids and he knew my sister Namrita’s baby was soon to be born. Mr PARTAP SHARMA was the Greatest ! A polished Gentleman of many facets. May His soul rest in eternal Peace. Heartfelt condolences to his berieved Family. I had the privilege of working with Partap Sharma on several occasions since 1985. On the first occasion, when we established our Alma-Mater roots, he accepted me as a personal friend… I was given direct access to him/home. At every occasion, I was treated to lunch at his sea-face home. We would share many aspects of Audio-Visual topics. On my last visitation, he had been diagnosed with COPD. We shared an overwhelming hour of spiritual and prayerful bliss. I fondly remember his face full of gratitude and joy! As I write this Email, I am listening to the School’s QCent AV and visualise Partap doing his unforgettable Voice-Over. I express my condolence to his family. A lot of us owe you our thanks for letting us know about the sad passing of Partap Sharma. I am a regular reader of the Times of India, and i do not think there was any announcement, unless I missed it. Even though I live in Mumbai, I had not been able to meet up with him for quite some time. I was corresponding with him when I was in the US till end August 2010, and we had talked about getting together on my return. I tried him on his mobile phone several times late last year and earlier this year, but was not able to get a response. The last time I heard from him was when he announced by e-mail about the passing of his brother, Rajiv. He was every bit that Malvika Sanghvi has described him to be. May God rest his soul in peace.